ave you read the Pulp Fiction script and been astonished at the writing? It can feel overwhelming when you sit down to write a screenplay, but the masters feel the same way. The Pulp Fiction script didn’t come from thin air. There was hard work put into every page. Today, we’re going to break all those rules as we go over the Pulp Fiction script. We even have a free Pulp Fiction script PDF for you. What is Pulp fiction Script's logline? "The lives of two mob hitmen, a boxer, a gangster's wife, and a pair of diner bandits intertwine in four tales of violence and redemption." Tarantino is now one of the world’s most famous filmmakers, but in 1990, he and his writing partner, Roger Avary, were a couple of indie filmmakers trying to break into Hollywood. Pulp Fiction (1994) wins Best Original Screenplay example. Tarantino and Avary were contemplating writing a trilogy of films about the criminal underworld. As they continued to jam on scenes together, they realized that an ensemble film told in chapters might be more interesting. So they kept at it for the next two years. What the wound up creating was more of a Pulp Fiction script outline. Tarantino on writing the Pulp Fiction script and all writing habits. 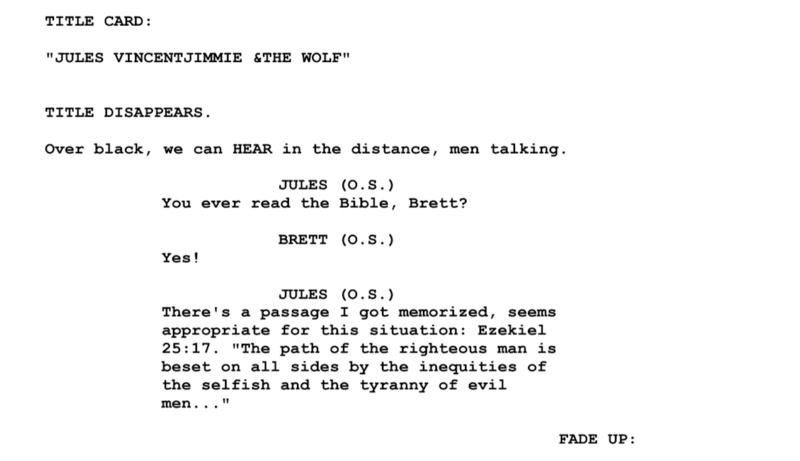 Download your FREE Pulp Fiction script (PDF). Just enter your email address and we'll instantly send it to you! In 1992, Tarantino was on tour with his first feature, Reservoir Dogs. Avary joined him in Europe, and the two of them went from hotel room to hotel room trying to finish their masterpiece, Pulp Fiction. 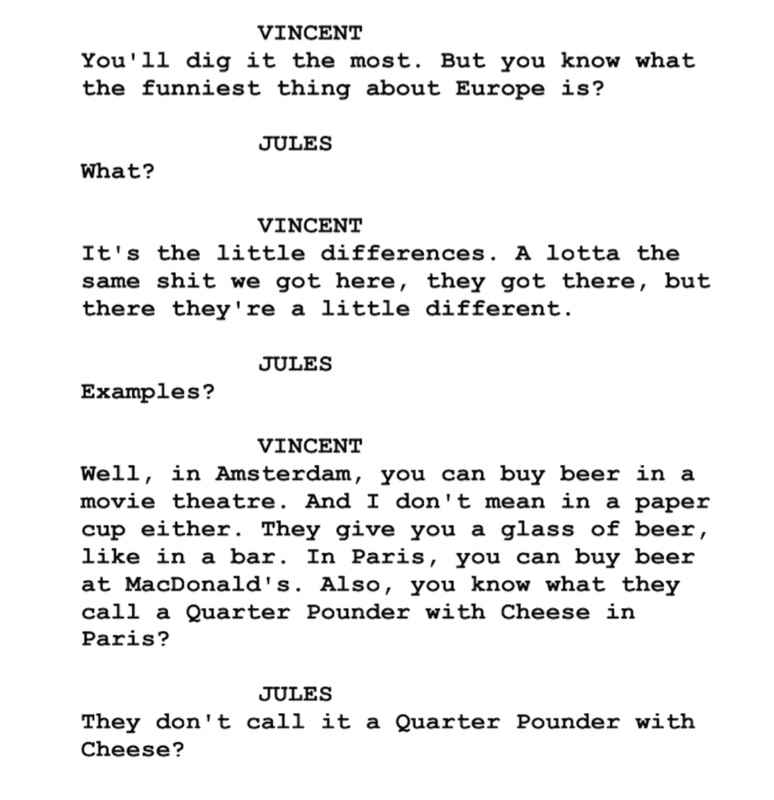 They finished the Pulp Fiction script in Amsterdam. Pulp Fiction went on to win the Academy Award for Best Original Screenplay in 1994. It also won Best Picture at 1994’s Cannes Film Festival. The Pulp Fiction Script wins an Academy Award. The Pulp Fiction script solidified the duo’s place in Hollywood and catapulted Tarantino to auteur status. Avary also achieved much acclaim, but some personal failings held him back. Regardless, the duo changed cinema with the Pulp Fiction script. Let’s examine it together. Back in the early 1990’s it was a novel idea to start off the movie with the dictionary definition of the words “Pulp Fiction.” This sets the tone right away. It says we’re going to go on a journey with these writers and that they’re in control on the page. 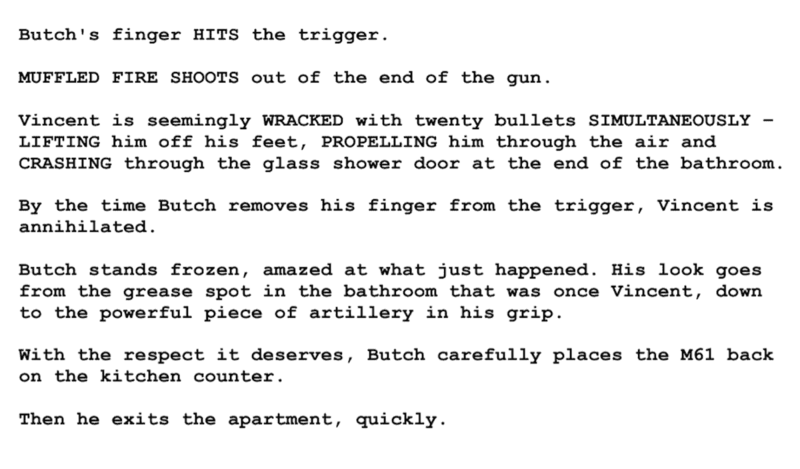 The Pulp Fiction Screenplay starts with a bang. 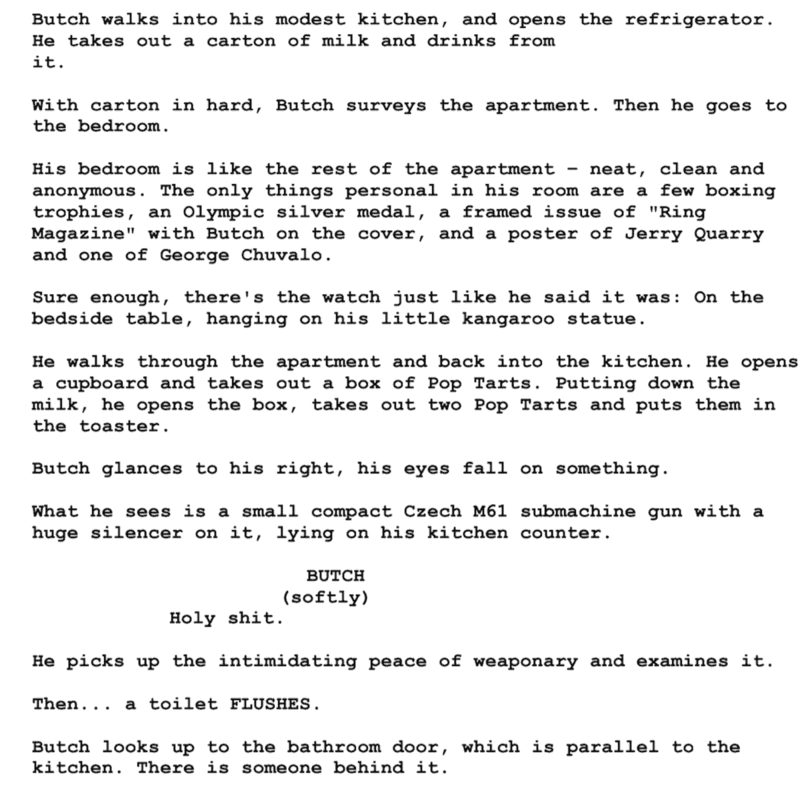 The first thing you notice about the Pulp Fiction script is that the action writing pops off the page. The Pulp Fiction opening scene is in a diner. It sets the tone for everything that follows. The Pulp Fiction script slug is standard. But what’s in the Pulp Fiction opening scene that counts. The Pulp Fiction opening scene put an emphasis on the normalcy of the place. It sets the readers up for something boring until they pull the rug out from under them. Once we meet our characters they’re an odd couple, and they speak fast. We’re hooked. That’s what makes this such a special screenplay example. Let’s check out a few other character introductions to see how we meet the ensemble. 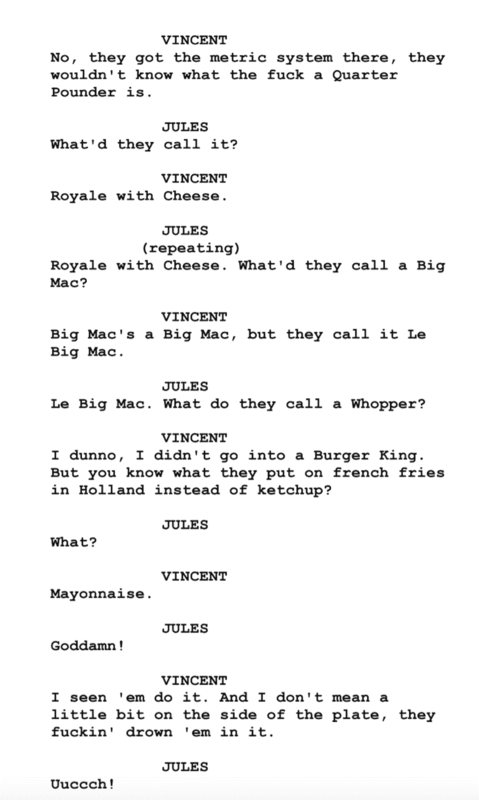 First up, we have Vincent and Jules. Tarantino and Avary work hard to show us these guys are alike in every way, except skin color. They’re a veritable yin and yang. This is where they work up their appetite for the Pulp Fiction burger scene. This is a stark description. We know he’s built because he’s a prizefighter. But the real star of the scene is Marsellus. Equal parts gangster and king. Again, there’s a hidden economy in the Pulp Fiction screenplay. We know just enough to get a mental image. The Pulp Fiction scene sets the tone for this relationship. Finally, look at how Mia gets introduced. Sparse, and with a song. We know she’s been partying a while if the song is playing indoors. We’re asked to infer a lot about these characters based on the world they inhabit. Mia’s infatuation with singing and dancing is foreshadowing to the Pulp Fiction dance scene. Since Tarantino and Avary know the average reader hasn’t lived in the seedy underbelly of society, they spend a lot of time getting their locations right. Like Jackrabbit Slim’s, the place where the infamous Pulp Fiction dance scene happens. Here we go overboard with the description in the Pulp Fiction screenplay. This place mattered to the writers. It was fundamental for the vision of Los Angeles they wanted in the film. This is a unique portrayal of the city that emphasizes the thematic elements of the title. Look at the magical Pulp Fiction scene description. 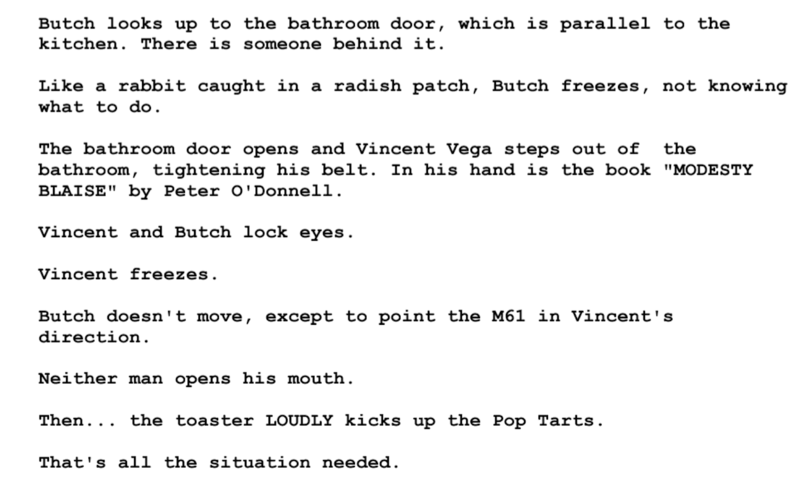 Lastly, let’s take a look at a real action scene in the script. This is when Butch sneaks back into his apartment to get his father’s watch. This is really one of the only times we get big blocks of action without any dialogue, but still focus on a character and not a place. Check out the spacing in the Pulp Fiction screenplay as tension builds. We go from heavy blocks to single lines. There’s a rhythm to what he’s telling us. We are learning things as Butch learns them. The Pulp Fiction scene description here creates drama and tension. As the tension builds our sentence spacing expands. Suddenly we stop with the blocks and move into a much more controlled atmosphere. This Pulp Fiction scene description pays off all the nail-biting. Even as the scene’s action builds to the crescendo, Tarantino and Avary take the time to make a joke. Vincent is on the john reading about modesty. That’s fun, and it doesn’t take away from the scene at all. It adds to the perverse humor we’ve found in the film’s portrayal of the mundanity of life and death. The Pulp Fiction screenplay lives on these dueling motivations. The end of the scene allows us a moment to catch our breath. Our heart beats with Butch’s heart. As he takes a breath, so do we. Then we all exit together. Now that we understand the voice on the page let’s take a look at the voices we’ll hear from the characters. Another reason why this is such a wonderful screenplay example is the “voice.” The voice is the stuff that’s on the page that no one sees, but the dialogue is what everyone hears. When actors read your script, they want to see their arcs, but they also want to know what you’ll have them say. As we mentioned in the opening, the diner starts us off at a torrid pace, but it’s not until we hear Jules and Vincent talk that we get something different. The Pulp Fiction screenplay lets conversations drive character. You have to remember that no one had ever show hitmen embracing everyday life. These are best buddies chatting while they go about their day. There’s a casualness that was inviting for the outsider. It beckoned us to come into the Pulp Fiction screenplay. Look at all the white space. This is truly a conversation and nothing else. It also allows the actors to improv and riff with their own body language in the scene. Let’s see how we pay all this burger talk off with the infamous Pulp Fiction burger scene. 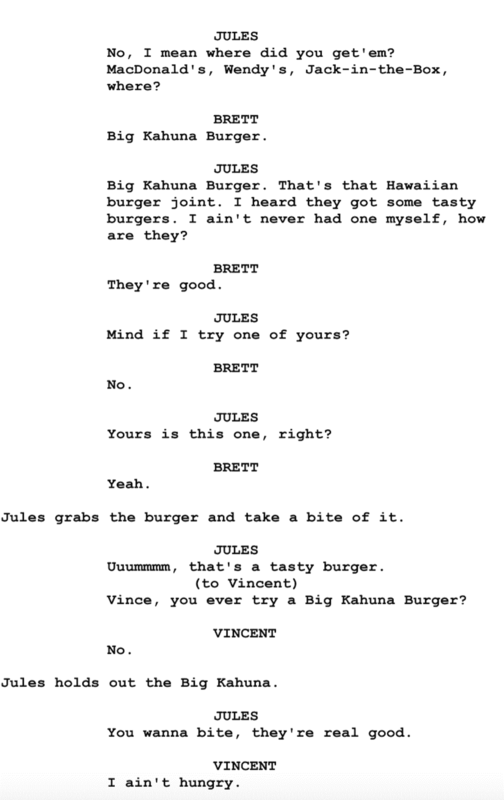 The Pulp Fiction burger scene. Again, these guys are driving the conversation. There’s not much scene direction for the actors, but we know they are in control of the conversation. Look at the answers Brett gives. One word. Two words. We sense the fear. Jules is much more loquacious. Almost playing good cop. Vincent balances him out. He’s menacing. Jules and Vincent set the tone, but the script expands on the ideals set up right here. If this is all casual, what about when we enter a more high-pressure situation? Like what if Marsellus Wallace’s wife is dying on you? The Pulp Fiction screenplay maintains humor even in the face of danger. We change from the larger monologues and segue into quips as two men lose their minds trying to save a woman’s life. This script’s dialogue still balances the humor in every situation. It controls the tone of the story and walks a very fine line. The most groundbreaking thing about Pulp Fiction’s story is that it’s told in non-linear fragments. Each chapter presented takes us into a different through-line. The characters intermingle, but the story changes. The Pulp Fiction screenplay uses title cards to break up the story. Check out how the writers formatted the changes on the page. It’s sleek and clean. The Pulp Fiction screenplay chapters are not in order. It keeps us on our toes. Each chapter in the Pulp Fiction screenplay feels like it brings its own energy. We transition into them, and it’s up to the audience to decipher who’s alive, dead, and where they are in their lives. We can pick out the clues by paying attention to what each person is wearing and how they act when they see each other. One of my favorite scenes in the Pulp Fiction screenplay. After the Pulp Fiction screenplay came out, there were many imitators. Lots of writers tried to copy the dialogue, characters, and plot structure. The most important thing to take away from this script is that when you’re developing your voice, be unique! Tarantino and Avary flourished because they found a way to put their vision onto the page. When you read the script, you can see the movie in your mind. But their strategy wouldn’t work for another type of movie or writer. Don’t try to copy someone else, find out the best way for you to say it on the page. The best way to do that is to read a lot of scripts. Finished brushing up on this Pulp Fiction screenplay example? Now let’s try something more family friendly. A script that still has memorable dialogue and a philosophical main character, but is a lot more economical on the page. A script that came from the Public Domain, connected to millions of viewers worldwide, and launched Dreamworks into the stratosphere. We’re talking about Shrek! And we're going to break down what makes it such a universally beloved franchise that all screenwriters can learn from. We'll even include some key insights on how you source your next great script idea for free from the Public Domain.